Information is power. We are made aware of this on a daily basis when we log onto our computers and encounter ads targeted directly at us. As information becomes more and more valuable in the digital age we feel increasingly uneasy as multinational companies and our governments take data we knowingly, and sometimes unknowingly, provide. The WikiLeaks scandal and now the Edward Snowden case have shone a spotlight on government surveillance and data collection, and how far it reaches into the private lives of regular citizens around the world. These recent events have created an atmosphere of uncertainty and distrust regarding data. How much privacy do we really have anymore? Can we trust governments and companies to respect our right to privacy, or at the very least use our data ethically? In an essay in 2011 at the height of the WikiLeaks drama, former Australian Ambassador to the United States John McCarthy argued that “[w]hat appears to be occurring — and must not — is a widening gulf between official and community attitudes” regarding the view of government surveillance and information privacy. Julian Assange, the founder and face of WikiLeaks, and a self-proclaimed martyr of the human right to freedom of expression, is one of Australia’s most infamous people. Yet, the Australian government, at least publicly, has largely been silent regarding their support of Assange as a citizen. It is ironic then that this government just wrapped up the 2013 national hacking event, GovHack. According to event organizers, GovHack invites developers and data enthusiasts from around the country to “play” with Australian government data and “create unique solutions and services”. Now in its third year, GovHack is a three-day event designed to “improve our democracy and find better ways of doing government services”. The concept of “playing” with government data, and the openness and transparency that comes with that, is perhaps surprising considering the current political climate internationally. Yet, through this event the Australian government is seeking to address key problems they have with data: volume and analytical capacity. Governments have enormous amounts of data about their citizens and how they live: data on consumption, transport use, energy consumption, demographic information, migration patterns, the environment — the list is endless. However, often this important information sits unused in the hands of government agencies. The Australian government designed GovHack because they lacked the expertise and resources to use this data effectively. The 2013 event saw over 1,000 participants, including over 700 hackers, competing in teams to develop ideas making use of government data. Participants came from a range of backgrounds — including software development, data analysis, journalism, and creative industries — and competed for over AU$170,000 in prize money as well as internships and mentorships with various company sponsors. 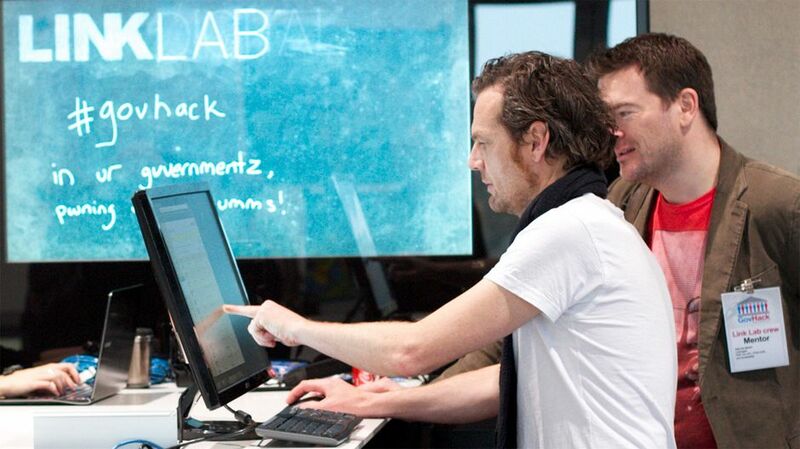 There were many novel ideas to come out of GovHack 2013. Projects ranged from finding out how individuals’ taxes are spent to finding the ideal place to live based on data including house prices, public transport access, and amenities combined with user lifestyle preferences. There were also a few notable ideas that used data in innovative ways to educate and empower individuals. “When will my house be underwater?” was a joint winner in the Greatest Potential for Research Impact category. The project strikes at the question on everyone’s mind regarding climate change: how, and when, will it directly affect me? Using special elevation data from Geoscience Australia and climate models that predict sea level rise, this winning proposal estimates when individual homes will be inundated with seawater. The project is particularly relevant for Australia where over 85 percent of the population lives within 50 kilometres of coastal areas. But there are many low-lying nations and regions throughout the world already experiencing the impact of sea level rise. In fact many of the most vulnerable areas are Pacific island neighbours to Australia and the country was recently advised to prepare for a potential influx of climate refugees. This project is just one example of how data can be used to reveal, predict and inform citizens of the many varying impacts of climate change. “ImpressMe – Your Carbon Imprint” was another project that was rewarded for its environmental approach. Using country and commodity trade data, the application calculates the user’s carbon footprint based on daily consumables and purchases. ImpressMe’s simple interface and usability sets it apart from the many other carbon footprint calculators that can be difficult to use with so many figures to input. The idea behind the project was to drive understanding of individual impact and create personal responsibility in order to provoke action. This project aims to respond to the disconnection many people feel between our everyday lives and how, in real terms, we contribute to climate change. Taking another approach, and directly addressing the transparency issues facing many governments at the moment, was “The Open Index”. This project uses a range of data — including financial reporting, responsiveness to freedom of information requests, website accessibility, and quantity and quality of data released by an agency — to measure government agencies’ transparency. Each government agency is then scored and placed on a leaderboard. This project emphasizes the democratic capacity of data to expose government activities. Finally, the “MyCommunity” project is an application to encourage the public to interact with their local community. Users can report local problems to the council, discover nearby events or create their own, find facilities such as libraries, playgrounds and schools and potentially connect with existing social networks like FourSquare. In an increasingly digital world, where more people are connected online rather than engaging with people in their physical surroundings, this application goes some way to using data and technology to facilitate face-to-face community interaction. While these projects may on the one hand seem novel, they also presented data in practical and informative ways that can contribute to society. Since they are only in their infancy it is unclear whether these ideas have the ability to change how we live, how we interact, or how governments operate. But they do start a conversation and build real trust between government and citizens. The current political climate has created a negative view of governments’ and companies’ use of our data, yet this event not only demonstrated that data can be used in many ways but that it is in fact “our” data. Rather than simply being taken from us for purposes that we are often not told about, our data has the capacity to empower and inform us. Data working for us, not against us by Sally Chadwick is licensed under a Creative Commons Attribution-NonCommercial 3.0 Unported License. Sally Chadwick is studying for her Master’s Degree in Global Media Communication at the University of Melbourne. She was previously an intern at the United Nations University Office of Communications in Tokyo.